RAE's Swarcotherm™ Thermoplastic is a pavement marking material that is a 100% solid, environmentally and user safe marking paint. 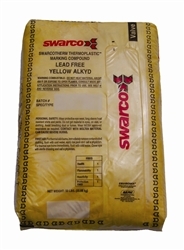 It is a mixture of Swarco glass beads, pigments, binder, and filler materials. Thermoplastic, as its name suggests, becomes liquid when heat is applied. 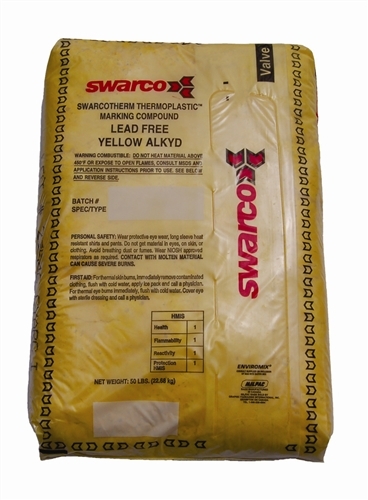 Hot applied thermoplastic is prepared in a melting kettle where the granular material is heated until it liquefies at temperatures exceeding 375° F. An agitator keeps the thermoplastic blended until it is transferred into a screed, ribbon or spray device where it is then shaped into its specified width and thickness as a line, legend or symbol. Glass beads are immediately applied to provide initial retro-reflectivity. 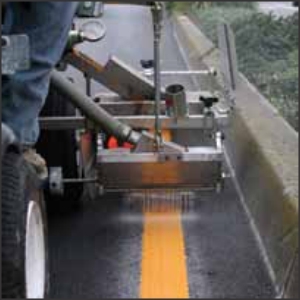 When applied on asphalt surfaces, thermoplastic marking paint develops a thermal bond via heat-fusion. When applied on Portland Concrete Cement and on oxidized or aged asphaltic surfaces, and a recommended sealer is properly applied, a tenacious mechanical bond is achieved. Providing that all necessary conditions are met concerning temperature of material and substrate, absence of moisture, road preparation and minimum thickness, you can achieve excellent performance using thermoplastic pavement marking compounds. Typical performance life ranges from 4 to 8 years depending on roadway conditions. 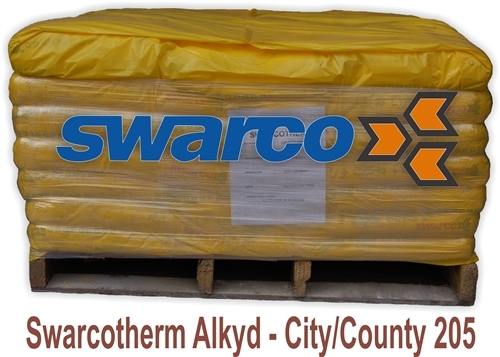 Graco® Thermolazer applying Yellow Thermoplastic Extrude and Glass Beads. AASHTO M-249 Specification incorporating changes required to meet specific state specifications. Standard packaging is forty 50lb. bags per 42" x 42" pallet. A moisture protective cap, with machine applied stretch film for increased protection and handling. Bags are thermodegradable and may be melted with the product. Drying Time: Less than 15 min at ambient temp of 90° F.
4 " Line 450 ft. 225 ft. 150 ft. 135 ft. 108 ft.
6" Line 300 ft. 150 ft. 100 ft. 90 ft. 72 ft.
8" Line 225 ft. 112 ft. 75 ft. 67 ft. 54 ft.
12" Line 150 ft. 75 ft. 50 ft. 45 ft. 36 ft.
18" Line 100 ft. 50 ft. 33 ft. 30 ft. 24 ft.
24" Line 75 ft. 37 ft. 25 ft. 22 ft. 18 ft.